This may be an image of the actual march described here — the offices of the Tribune and the Times are visible. 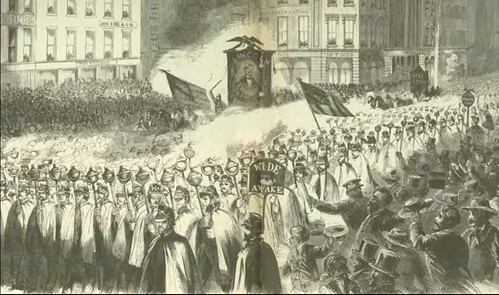 Extensive preparations for a giant rally of Wide-Awakes in New York, October 3, 1860. The City is full of strangers from all parts of the country. For several day’s past they have been gathering here to witness and take part in the torch-light procession of the Wide-Awakes to-night, The hotels are full, and the houses of private citizens are overran with rural visitors. Eligible locations on the route of the procession are eagerly sought for by many more than will succeed in obtaining them. We have heard of few private decorations in the streets through which the Wide-Awakes will pass. The transparencies in front of the various Republican head-quarters will of course be illuminated. Mayor WOOD has forbidden the erection of the proposed triumphal arch which was to have been thrown across Broadway, in front of the Republican head-quarters, No. 618. Marshal GAVIT, Chairman of the Committee which had the matter in charge, and Mr. CARLOCK, visited the Mayor yesterday for the purpose of obtaining his permission to build the arch. He peremptorily forbade them to erect it, and said that no political organization should place anything of the kind in the streets. Marshal GAVIT told him that arches were to be erected in honor of the Prince of Wales. That, the Mayor said, was a different matter. The arch, for which $400 had been appropriated, was to rest on abutments sixteen feet high, and the highest part of it was to be twenty-six feet above the street. On the two columns respectively were to be the names “LINCOLN” and “HAMLIN;” on one side of the arch, “Brothers, we greet you,” on the other, “Freedom and the Constitution,” and on either side “Salve.” The letters were to be formed by variegated lanterns, which, besides, were to cling round the pillars, and hang in festoons from the arch. The design was a very pretty one, and there is great regret that it could not have been carried out. The architects had been employed, the carpenters engaged. Mr. GAVIT told the Mayor that as Chairman of the Committee and a law-abiding citizen, he would have to submit, and the arch could not be erected. Mr. LINDENMUELLER, proprietor of the Melodeon, in the Bowery will decorate the front of his building with banners and transparencies of WASHINGTON, LINCOLN and HAMLIN, and will make an extensive display of fireworks. Round us a shield and bright as molten silver the moon uprose last evening about 7 o’clock, touching the cupola of the City Hall with right and throwing out into delicate relief the foliage and branches of the Park trees, as your Reporter hastened from the TIMES Office to Broadway, on his way to view the Wide-Awakes. Even at that early hour, the Park itself and all the sidewalks were densely crowded, the stages and carriages having to slowly crawl up the centre of the street through dense fringes of excited and expectant humanity. Windows and stoops were packed with curious faces; all the corners displayed mass-meetings in embryo — fresh accessions constantly thronging up from the side streets to swell the numbers or supply the places of those lucky ones who had managed to push their way into the main upward-drifts of the palpitating current. The Wide-Awakes have invented for themselves a peculiar cheer, consisting of a numerical recital — “One, two, three” — “four, five, six” — “seven, eight” and then a terrific “tiger.” The effect is somewhat startling to weak nerves; but the enthusiasm and high discipline of the whole body demand that every allowance should be made for such eruptive explosions of feeling. One Company, while giving these cheers in front of the Tribune, provoked a retort of groans from a crowd of Douglas Democrats, who had assembled on the steps of Tammany Hall — just as shipwrecked mariners might perch themselves, all huddled together, on a rock, to escape the rising fury and wrath of the waves which had stranded their vessel. This was the only case falling under our observation in which the Democratic majority of the City made the slightest advance towards interfering with the political exercises of their Republican opponents. These are the Wide-Awakes that Southern newspapers were decrying as some sort of paramilitary abolitionist force. It seems a bit more like Mardi Gras Krewes to me. This entry was posted in Republican. Bookmark the permalink.